James Atkin's Poker Blog pokerstars Sunday Million Sunday Million runner-up loses his $148k winnings in just 5 days! Sunday Million runner-up loses his $148k winnings in just 5 days! I was intending to write a detailed blog post on this, but had second thoughts. 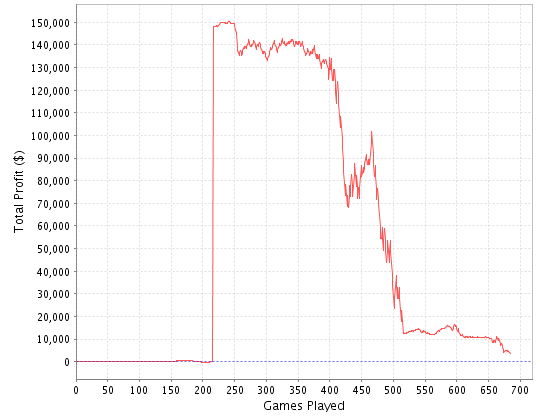 Just yesterday I was discussing the negative effect that sites such as Sharkscope and PokerTableRatings have on online poker, and I felt like it would be a bit brutal/unethical to go too indepth into it. 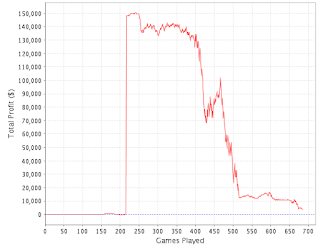 2+2 Thread: "This week's Sunday Million Runner Up has questionable bankroll managemennt"
Played various stakes Heads Up Hyper Turbo SNGs, and ended up playing $15 heads ups with the remainder of his roll. One has to feel sympathetic, I can't imagine he is feeling too good right now (ldo). Although probably not to this extent, I imagine most people who play poker have at least some experience of degeneracy, and can also empathise with him to some extent. Considering how many big money winners there are every Sunday, and the number of satellite entries, it's a little surprising that you don't hear about this kind of thing more often. The last time a player gained this notoriety was perhaps 'bommel222' who won $30,000 by finishing in 2nd place in the Guinness World Record breaking largest online poker tournament ever held (which had just a $1 entry fee, and over 149,000 entrants), and proceeded to lose all his winnings in just 67 hands playing $200/400 FLHE and $25/50 NLHE. One feels compelled to remind everyone of the excellent Gaming Controls available on PokerStars. You can self-exclude yourself from playing above a certain limit in cash-games, tournaments and sit and gos. If that isn't sufficient, you can also completely self exclude yourself from PokerStars for a set amount of time (there are 12 and 24 hour durations, as well as 7, 30, 60 and 120 day durations). 0 Comment to "Sunday Million runner-up loses his $148k winnings in just 5 days!"